The second night of the Rolex Middle Sea Race could well be a decisive part of the race. At 1700 CET, 39 yachts had passed through The Straits of Messina, the tide was set to turn against those yachts that did not make it through and with the wind due to fade during the night. The Messina Trap is likely to take grip on a number of yachts this evening. 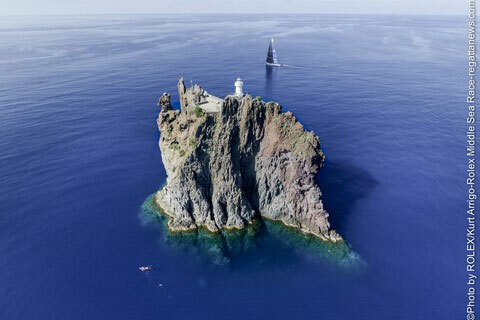 Igor Simcic's Maxi Esimit Europa 2 passed Stromboli at approximately 1430 CET and was making 8 knots. The next corner is the beautiful island of Favignana, off the North West corner of Sicily. If Esimit Europa 2 enjoy good breeze during the night, the team could be turning south in the early hours of tomorrow morning. A record run for Esimit Europa 2 is very unlikely but the wind is expected to become very light for the yachts behind and to the north of Sicily. Esimit Europa 2 may be able to keep going in fresher breeze and mount a challenge for a win on corrected time as well as line honours. In IRC Two, 15 yachts have now passed through the Straits of Messina. Stefan Jentzsch's Carkeek 47, Black Pearl is leading under IRC after time correction by just eight minutes from Dmitry Samohkhin's Swan 60, Petite Flamme. Andy Beadsworth, tactician on board Petite Flamme contacted the Rolex Middle Sea Race Media team. "This morning the approach to Messina was very difficult, we had very little wind and adverse current in the middle of the channel. We went right inshore on the Italian mainland, with less than 1.5 metres under our keel. There was lots of cheering from the bathers on the beach! The tactic worked and we made it through Messina in good shape but we still have very little wind about ten miles away from Stromboli." David Anastasi, racing on J/122 Oiltanking Juno is taking part in his 11th Rolex Middle Sea Race. Oiltanking Juno is going well and have found good pace and provisionally Oiltanking Juno is leading IRC 3. David reflects on the experience learnt after taking part in the race so many times. "The Straits of Messina is a major turning point in the race, if you fall back here the chances for a good position are practically gone. When you arrive at the straits you either get a free ride with the help of the tide or have to fight against it. It is a gate, which is either open or closed depending what time you arrive." Royal Ocean Racing Club Admiral. Andrew McIrvine, is racing on Grand Soleil 46, Belladonna, which is enjoying a great battle with Oiltanking Juno. Belladonna passed through The Straits of Messina at 1700, just as the tide was due to turn - shutting the gate. "The tide has not even remotely behaved as it should do!" Explained Andrew McIrvine from on board Belladonna. "We were supposed to have tide with us but we have been fighting against the tide until we got very close to the exit. What is more, we have been in a gybing duel with Juno, Anna, and Iskareen along the Italian coastline to stay out of the tide. We must have put in 40 gybes this afternoon and last night I counted 16 sail changes. The weather may be light but the crew have been working hard to keep us competitive." Zenhea Takesha, skippered by Aldo Quadarella, has retired from the race and are making their way back to Malta without requiring any assistance.